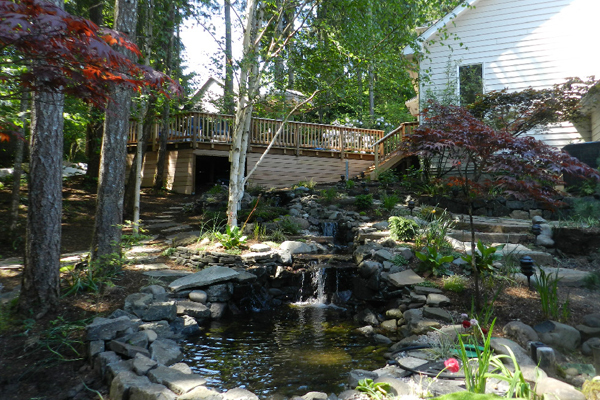 Do you have the perfect spot in mind for a waterfall and pond? Do you have limited space with only room for a simple bubbler? Would you like to explore what is possible? We have very creative minds and have been putting them to work for our clients creating beautiful landscapes. Graham Landscape and Design LLC is fully versed in all aspects of waterscapes and can certainly help design a waterfeature for your enjoyment. Check out our Ponds and Streams page for some examples of our work on larger scale water features. The Bubblers page shows some examples of what is possible when your real estate for the water element is at a premium.